It was 40◦ C in Aosta that afternoon. I was afraid to do the computations, and I wasn’t yet aware that this would be the night I spent in a lawn chair on the balcony of the flat, hopeful for breezes and night air. After helping grade the examinations in what would be my last duty of the term, I took off up into the Alps with my colleagues and friends, Anna Anselmo and Rosie Crawford. 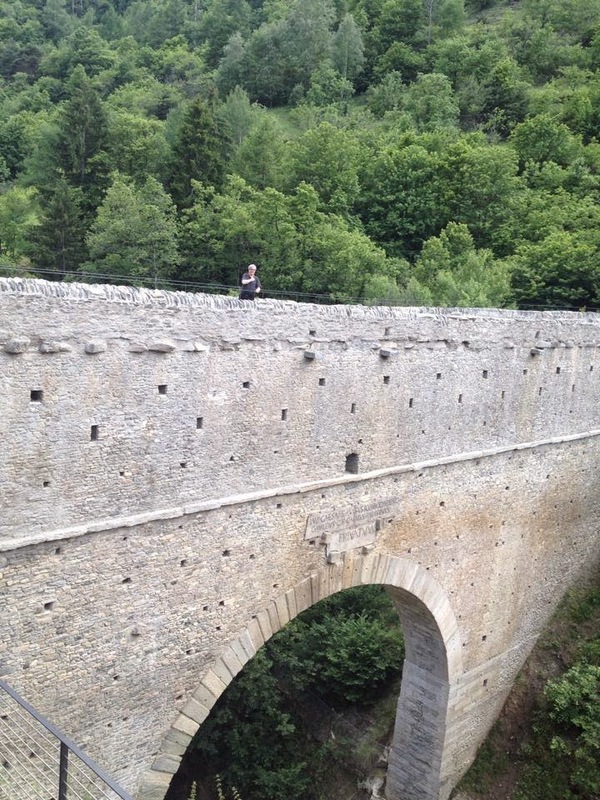 We were headed toward the bridge at Pont d'Aël, the largest and most formidable of the bridges in the region. 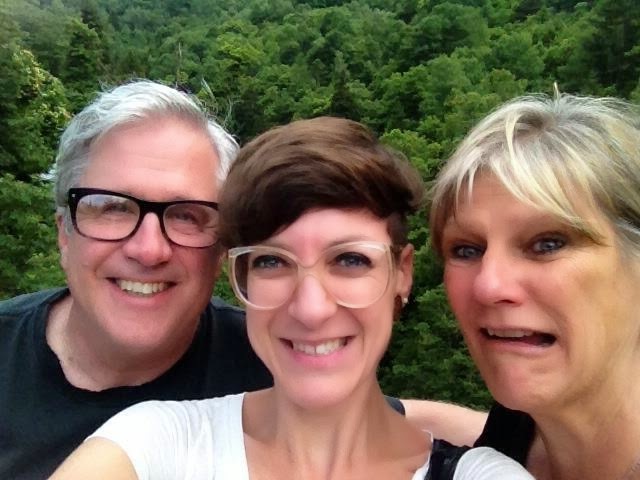 I was assured that at that height the temperatures would be more forgiving, and Rosie drove us smoothly over the narrow, winding roads, pointing out the occasional sites of stories that were what I would call “Italian Gothic”—tales of child-murder and isolation, strewn with public and private tragedy. We stopped for a drink part of the way to the site, as Rosie parked the car with magnificent disregard for traffic laws and we headed to a little pub equipped with good beer, a friendly Corgi, an overlook of Alpine meadows, and a cool late afternoon that gave respite from the heat in the town. We were hastened, not rushed. Most Italians are not rushed. 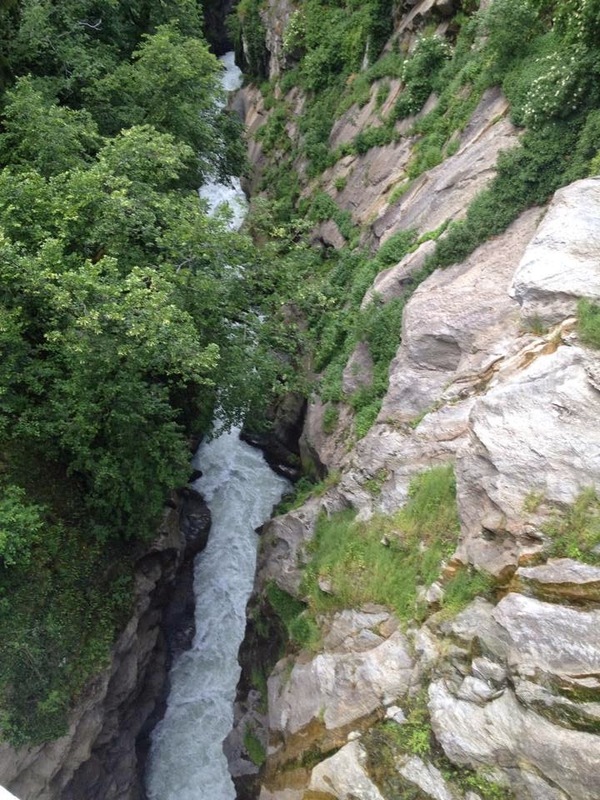 But if we were to meet our colleagues for dinner at Taverna di Gargantua (which was, by the way, a remarkable little restaurant back on the outskirts of Aosta), we would have only a small space at Pont d'Aël. It was to be an exalted space. It was Anna, more compassionate than I, who speculated as to how had many lost their lives in the building of this structure. She was right, of course, but it was a thought lost to me in the huge sublime of history. This bridge, like all Roman structures, was built as a show of imperium. Of course it provided transport and water—I’m not denying that—but the idea of it all was more than pragmatic: it was a footprint, a sign or presence and dominance, and as I thought that, Anna’s observation resonated in melancholy and irony. The inscription on the bridge attributes its making to a Caius Avillius Caimus, who, along with Augustus himself, are the names commemorated on the structure, while hundreds, perhaps thousands, labored in anonymity on a span that is nearly lost now, the roads to it obscure and narrow and winding, the woods encroaching to claim it. The Pont d'Aël, Rosie told us, is relatively unknown even by the neighboring school children, though efforts have been made to acquaint them with the history of the region. 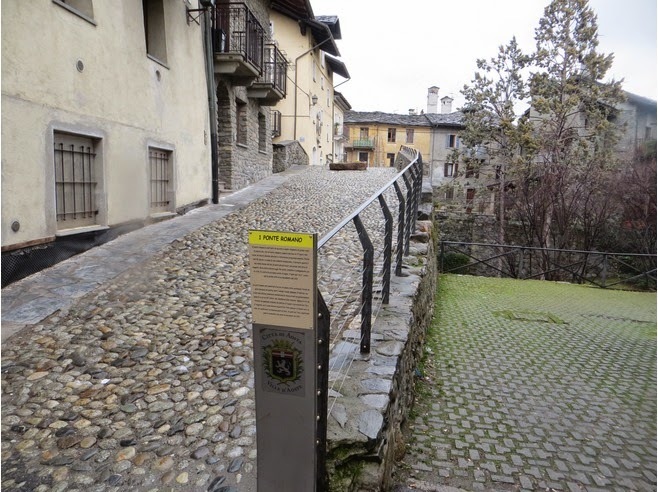 Next to the other two bridges I consider in this triad of entries, the little Roman Bridge in Aosta is smaller, more sunlit, more wed to the business and architecture of the town that grew up around it. Small enough to be considered charming, lined with 17th century shops and dwellings, it is domesticated unlike the bridges at Pont d’Aël or Pont St. Martin. And yet a message survives in its making, its orientation—difficult to translate at this late date, but still apparent if you simply follow your gaze west through the town. The little bridge empties on its western side at a spot where you can look across a leisurely circle of road, neither compact nor businesslike enough to be called a roundabout. The circle hedges in the great Augustan Arch of the town, and standing at the foot of the bridge, looking through the arch, you can catch a glimpse of further structures—the Praetorian Gates, and to the right of them, scarcely visible above the rooftops, the ruinous scaenae of the Roman theatre. It is a rhetoric of arrivals, far smaller and less intimidating that the paths to the Fora in Rome, but a formidable approach nevertheless. The terms under which you make the journey have changed in two millennia: time was when you were to be awed by Roman power, here at a far-flung outpost where the builders would no doubt have been insulted to hear their bridge described as “charming”. Instead, they would have thought in terms of imperium, that quality, according to Cicero, sine quo res militaris administrari, teneri exercitus, bellum geri non potest (which, if my Latin is not far more ruinous than the bridge, translates to something close to “without which military matters cannot be governed, the army cannot be held together, and war cannot be waged”). These days imperium is masked by the layers of years, but a straight arrow shot by an archer more powerful than we could imagine could carry through two arches toward the far end of Aosta, where Mussolini’s wolves, symbols of two imperial visions layered atop each other, would mark the end of the line.